This design was for a national retailer occupying an existing building. The 593,000 SF includes 10,000 SF of new office space in addition to the warehouse and distribution facilities. New electrical services, evaporative cooling, expansive dock doors, and equipment for a new guardhouse is also included. Sub-Zero is a high-end brand of residential major kitchen appliances, including refrigeration and wine preservation products built in the USA. Constructed in a foreign trade zone, Deutsch provided tenant improvement design for this production, assembly, and distribution building that also included office spaces and staff amenities. The facility is utilized to roll out two new appliance lines for the Subzero/Wolf Corporation. This facility is their west coast distribution facility and is the home to 10 of their 14 manufacturing lines. This project was delivered with an aggressive 8-month schedule, from notice to proceed through certificate of occupancy. Deutsch provided architectural design services for this fresh produce distributor. The facility included 30,000 SF of refrigerated area, with the balance of the space to include supply and truck storage and warehouse space. 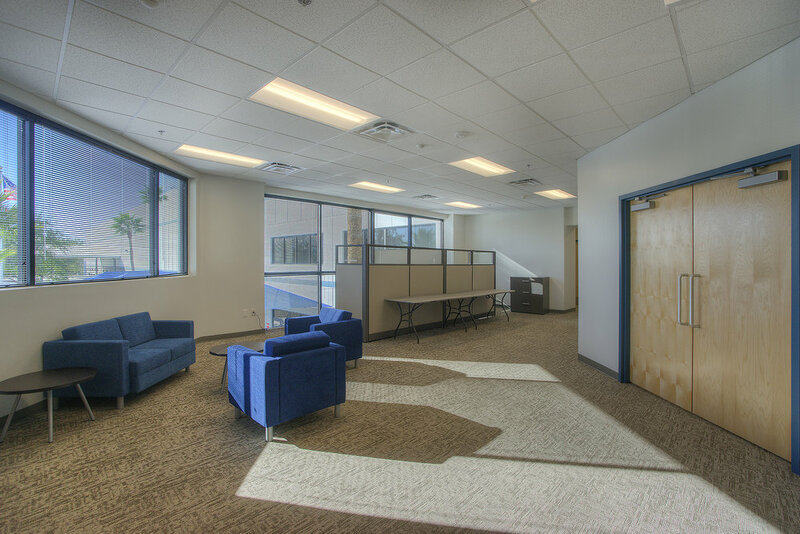 Office areas are located in the North structure and include workstations, a conference room, technology room, copy and records room, break room, food safety and training rooms. As an importer, distributor and manufacturer, our client wanted a very specific complex to handle a full line of premium quality food products. The design includes a warehouse, cooler and freezer space, 6,000 SF of administration offices, a breakroom, restrooms, and locker room areas. A two-story mezzanine in the warehouse houses additional office space. STO Corporation is a major manufacturer of Exterior Insulation Finishing Systems, EIFS. The warehouse is a new pre-engineered structure designed to make room for production expansion and to consolidate offsite storage. Although the building is a typical pre-engineered building, STO wanted to highlight their product and eliminated the metal panel exterior sheathing, using framed exterior walls, and an applied EIFS finishing system. Clear height is at 33’-0” for high pile storage. Daikin is a Japanese multi-national air-conditioning and comfort systems manufacturing company. Deutsch provided design services which required modifications to both the building and the site. The site adds new high-loading docks and fire risers. Interior design improvements included 8,000 SF of office area; installation of two large overhead doors; electrical service modifications, which adds an additional 1400 AMPs; HVAC units to condition the entire building; and the addition of clear-story windows. 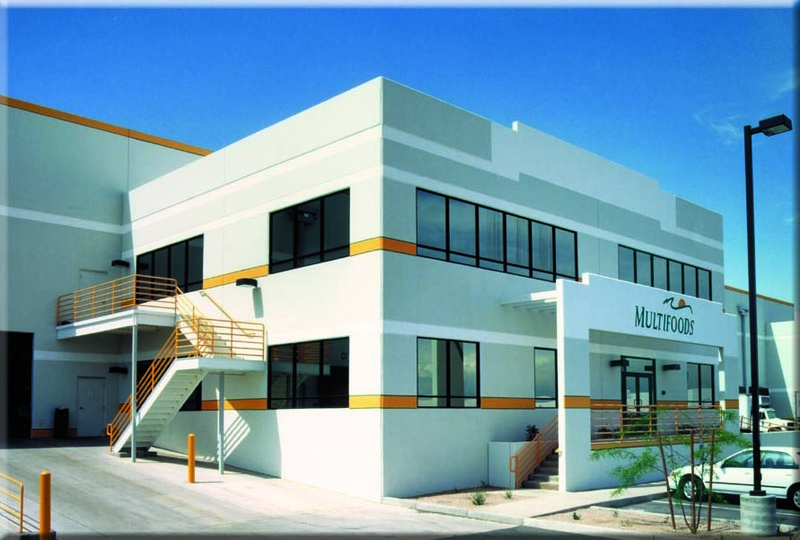 Deutsch designed this new facility to replace the client’s facility previously located in the City of Maricopa. The new production facility manufactures premium, non-sensitizing natural rubber and is located within an existing pre-engineered metal structure that was modified into a fully-enclosed building. Phase I Process Line will incorporate chemical storage, packaging and compounding, maintenance, as well as a lab, break room, offices, and restrooms. Deutsch worked collaboratively with Spanish Architect Daniel Villanueva to design this building located on a Greenfield site. This manufacturing facility produces tempered glass reflectors used in solar thermal power plants. The project represents Phase 1 of their new North American manufacturing facility and the home of their U.S. Headquarters. This fast-tracked, design-build project enabled the owner to start producing mirrors just 7 ½ months after the start of design. The first batch of mirrors produced will be used for parabolic concentrators at Abengoa Solar’s 280-MW Solana Generating Station. Electricity generated by the plant will produce enough power for 70,000 homes. 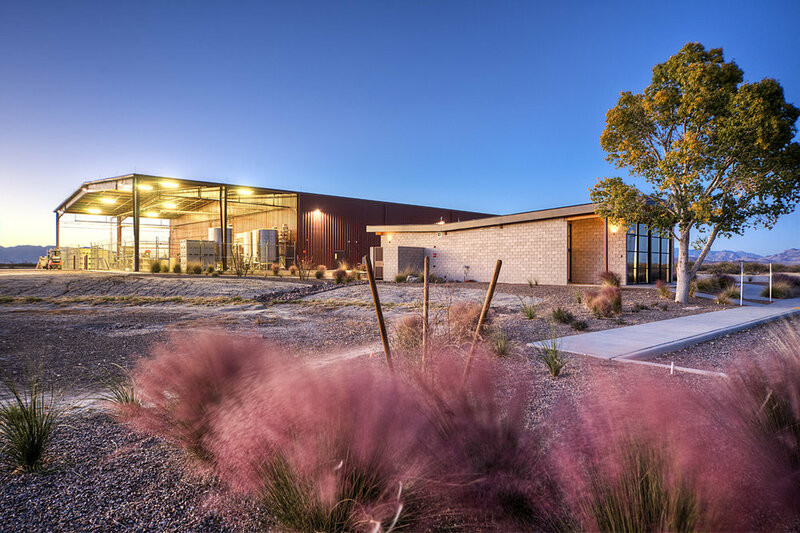 Deutsch designed this warehouse facility that distributes produce, such as fruits vegetables, herbs, spices and various dairy and frozen food items. The facility consists of 7,000 SF offices, conference rooms, rest rooms, shipping and receiving areas, cashier spaces and a commercial kitchen used for training. The project also includes 30,000 SF of coolers designed for flexibility to accommodate expansion and change in temperature, 2,000 SF of freezer space, 12,5000 SF of dry storage. Huhtamaki is an industry leader in technologically-advanced, sustainable packaging solutions and disposable tableware, producing paper drink cups, insulated hot cups, food containers, pressed paperboard plates, and thermoformed plastic cups and lids. 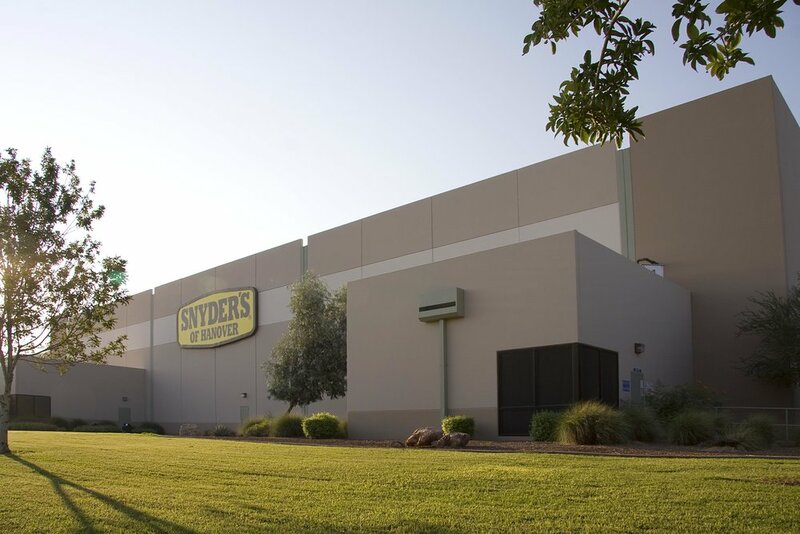 Deutsch provided architectural design for this manufacturing and distribution facility, which is a remodel of the former Rubbermaid building for which Deutsch did the original design. The warehouse distribution center is approximately 225,000 SF and the manufacturing area is 350,000 SF and includes office and support spaces. Deutsch designed this operations center to service the U.S. Western Region for Lisanti Foods, one of the country’s largest Italian food distributors. The project included a distribution warehouse, 11,622 SF of freezer space, 8,000 SF cooler space, 6,000 SF of office area and executive offices. Deustch Architecture provided architectural design for a new vehicle storage facility to Jones Lang LasSalle forthe Enterprise Car Rental facility. The project is located on the southest corner of 19th Avenue and I-10 in Phoenix. The site is approximately 17 acres, expandable to 24 acres. This facility will incorporate approximately 3,500 parking stalls, a 12,275-SF administration building, a two-bay maintenance facility and an above-ground fueling station. Secured access from West Watkins Street is provided for the vehicle storage area, and employee and visitor parking areas were also provided. Deutsch Architecture provided architectural services for this Design-Build team for this industrial tenant improvement project. Novembal is relocating their current plant in Mexico to an existing retail park in Peoria. The facility will have approximately 50,000 total SF of manufacturing space, which includes 30,000 SF of warehouse and 15,000 SF of production space. Also included in the TI will be eleven process lines and 6 silos, as well as a utility yard to hold the silos, mechanical and cooling equipment. This improvement will also include office space, lab area, a mold shop, a tool and maintenance shop. Tenant improvements of an existing 304,000 SF spec industrial building. Deutsch Architecture Group was brought on board the week of purchase to begin creating tenant improvement plans to turn the distribution warehouse into a state of the art environmentally friendly paint manufacturing facility. Tasks included a site plan modification on an expedited schedule through the City of Phoenix to accommodate a railroad spur and an 8,000 SF outside tank farm storage facility. Representatives at Dunn wanted the facility to be LEED certified and also wanted the project delivered utilizing full Building Information Modeling (BIM) by both the design and construction team. Programming meetings with Dunn-Edwards executives, Dunn manufacturing staff from multiple states and key members of the design and construction teams were held in Deutsch’s offices two days a week for approximately six months. Deutsch provided architectural design, project management and construction administration services for this new pretzel manufacturing plant. Deutsch coordinated the work through the Client’s headquarters in Hanover, PA. We negotiated a development agreement with the City of Tolleson to reduce the budget by $600,000 AND schedule by 2-1/2 months. Deutsch was brought on again to provide Snyder’s with a 67,000 SF addition to their existing facility. The additions included a warehouse, packaging and process facility, process A/C and second floor administrative offices. Deutsch provided architectural design services for this 90,000 SF food warehouse and distribution center consists of 6,000 SF of office space, 20,000 SF of freezer storage and 10,000 SF of cooler storage. The facility also includes dry storage, a refrigerated cool dock, 14 shipping and receiving docks and an ammonia refrigerator system.